This detail is from the central section of Diego Rivera's Dream of a Sunday Afternoon in Alameda Park. This fifty foot fresco takes the viewer on a Sunday walk through Alameda Park, Mexico City's first city park that was built on the grounds of an ancient Aztec marketplace. The large mural represents three principal eras of Mexican History: The Conquest, The Porfiriato Dictatorship, and The Revolution of 1910. In chronological order starting from left to right we meet numerous prominent figures from Mexican history. 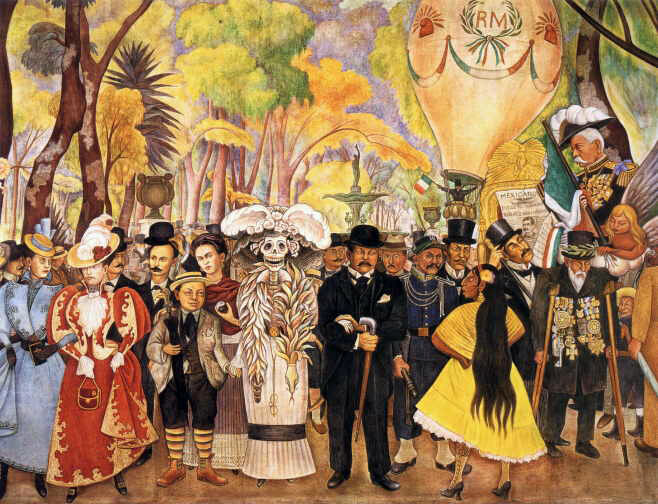 In the center of the mural is Diego Rivera at the age of ten being led by the hand by the Dame Catrina ("La Calavera Catrina"), a skeleton figure parodying vanity created by the popular Mexican engraver Jose Guadalupe Posada. The well-dressed gentleman in a black suit and derby hat is Posada, who stands on the right of Dame Catrina and gallantly offers her his arm. Posada was highly respected by Rivera, who claimed him as one his artistic luminaries and teachers. Posada's narrative style was an extremely influential model for Rivera's mural painting. Calavera Catrina, a symbol of the urban bourgeoisie at the turn of the nineteenth century must be taken here as an allusion to the Aztec Earth Mother Coatlicue, who is frequently represented with a skull. Coatlicue wears the plumed serpent, symbolic of her son Quertzalcoatl, around her neck as a boa. Her belt-buckle displays the Aztec astrological sign of Ollin, symbolizing perpetual motion. The adjacent figure is Frida Kahlo in a traditional Mexican dress holding in her left hand the Yin-Yang symbol of duality taken from Chinese philosophy, which also represents the duality from pre-Columbian mythology. Kahlo's other hand rest maternally on the shoulder of the young Diego, who sets out on his walk through life and through the world under her protection. This mother-child aspect of the couple's relationship is also brought out by Frida Kahlo in her article "Portrait of Diego", published in his honor in 1949 for his fiftieth anniversary of his artistic career.